The Indian tablet Aakash made it into the headlines with its extremely affordable price. Initially, it was aiming for $35 apiece - truly a tablet for everyone in the second most populous country in the world. And now it’s getting its second edition, but what surprising about it is not that ground-breaking specs. It’s got a single core 800 MHz processor and 256 MB of RAM with 2 gigs of internal storage. What’s surprsing is that it wants to run on Android 4.0 Ice Cream Sandwich. Why is this shocking? Well, first of all it’s below the minimum requirements for the operating system. And second of all, if it runs fine, it will put a serious question for all handset makers that chose to update only limited handsets to the latest Android. Most explained that the low specs prevented mid-range devices to get bumped up to ICS. Of course, there’s also the likely possibility of the Aakash tablet running painfully slow, just like many other underspecced Chinese slates out there. But we’ll keep a close watch and let you know. I like ICS on my Galaxy s2 but, ICS on Aakash tablet really made me surprised. Even if ICS runs successfully on low end devices like Aakash tablet .They wont be able to take the real taste of Ice Cream Sandwich. More crap for poor people. What India needs is a Foxconn factory. 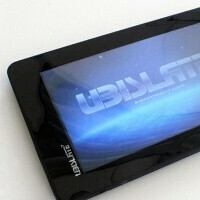 Are you rich enough to buy Aakash tablet? The company? A couple of them,actually... The only reason I would is to shut it down. heheheheh. Republican.... you have an iPhone i take it? But of course; It's the only true choice for Upper Class discerning individuals. Well, Gingerbread took a bit of effort to get on the 256 MB RAM (with 256 ROM) Droid 1, and it didn't run the best. It worked, but install any Google app or modern app (they have large footprints) and it's going to be an exercise in frustration. I don't see it happening, or even being worthwhile. Welcome onboard,Hussain. Together we shall rule the Galaxy!! !